DELIVERING ADVANCED SAFETY AND INCREASED PRODUCTIVITY TO THE TELECOMMUNICATIONS INDUSTRY. Sydney, Australia, October 28, 2014 — /EPR COMPUTER NEWS/ — The award-winning TechTable was officially launched in the US at the BICSI Fall conference and provides a portable, lightweight and sturdy work surface for communications technicians to safely and efficiently terminate fibre optic and copper communications cabling. Installers of highly complex cabling projects have seen rapid advances and developments in termination technologies however there have been very little improvements in the cluttered and uncomfortable work environments. By using the TechTable, installers can now perform tasks at waist height and easily rotate between standing and seated positions. 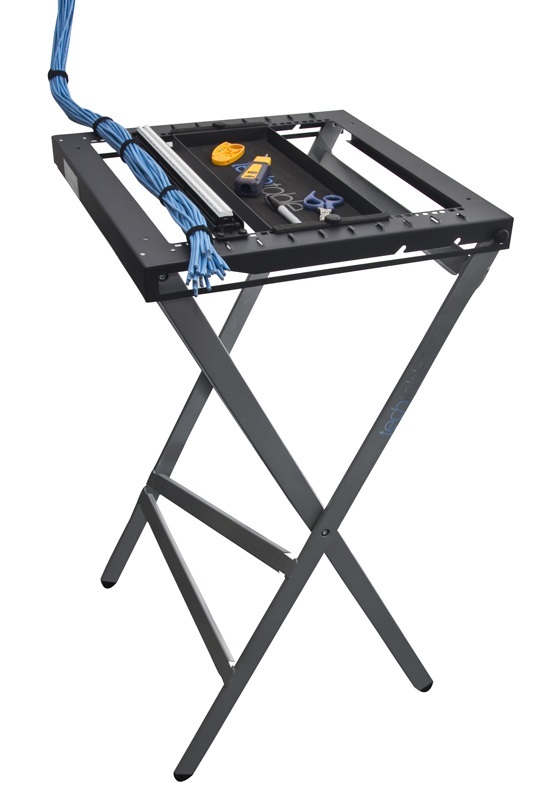 The platform is height adjustable, stable and comfortable and allows technicians to temporarily mount a patch panels and components onto the table for faster loading, termination consistency and improved accuracy. After much of his own research, David formed a team consisting of OHS consultant Glenda Snoxall, ACT Safety Regulator and Ergonomist Richard Siddell and Peter McKay of Industrious Design to develop a solution. Following an in-depth risk assessment and report in accordance with the code of practice for the prevention of Musclo-Skeletal disorders 2007 the TechTable was designed to address the key features required from a health and safety aspect and ensured compliance with this code of practice. Prior to commercial release, The TechTable was trialled by a number of communications and electrical service companies with feedback indicating that it not only offered a much more comfortable position than traditional installation methods, but also delivered far greater accuracy and speed. Testing also identified that manual handling risks were either eliminated or reduced, and the installer’s productivity was increased by up to 24%. The TechTable is designed for easy daily transport inside a padded carry bag and the set-up time is less than one minute. The dimensions are designed to suit tight-fit positions in cluttered computer rack environments, telecommunications rooms and data centres.